Santa Clara Vanguard will celebrate its 50th anniversary in 2017, but 2016 marks another major milestone for the organization: the 25th anniversary of the Vanguard Cadets’ first trip to the DCI World Championships. On August 4, 2015, the Vanguard Cadets won their fourth DCI Open Class World Championship title. This past year they placed second to their friendly rivals, Blue Devils B. Not many know, however, that the journey to become champions actually began way back in 1991. 1991 was a year full of notable achievements in the drum corps activity. Star of Indiana won its first and only DCI World Championship finals, Sky Ryders made its last appearance in the Finals competition, and Pioneer won its first of three gold medals. 1991 also holds significance as the first time the Vanguard Cadets ventured onto the DCI World Championship stage. 2016 marked the 25th anniversary of that milestone, and many involved still remember what happened with pride and distinction. Started in 1971 as a feeder group to the Vanguard “A” corps, Vanguard Cadets was primarily educational focused in its mission and limited to parades before evolving into a full-fledged competing corps. By the 1980s, the corps had transformed into a competitive A-Class unit on the West Coast, but it was still young, inexperienced, and relegated to local shows with national touring a far-off dream. “After we changed the corps name from Vanguard “B” corps to Vanguard Cadets in 1988,” former corps director JW Koester explained, “we started traveling more throughout the West Coast and into Utah and Wyoming. We felt that traveling attracted more members, and at the same time, exposed them to what drum corps life was all about. 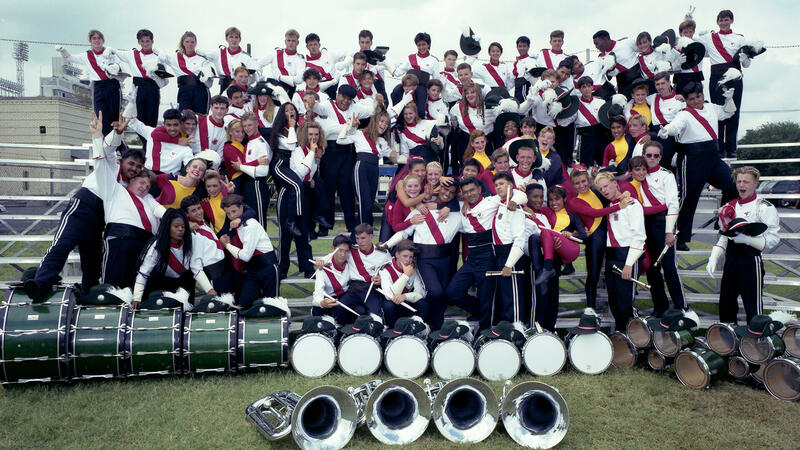 “In the fall of 1989, Vanguard director Gail Royer and I were discussing what was next for the cadet corps, and I asked about going to the DCI World Championships. Gail said he didn’t think we were ready for 1990, but that we should plan to go in 1991 when the contest was to be held in Dallas. Both Leon and Thompson were at that age, but one of those members who skewed the average was a very mature co-color guard captain, Stacy (Johnson) Franqui, who, at the tender age of 12-years old, had already marched four years with the corps. Additionally, she had trained and competed with Vanguard B’s winter guard program and the world-renowned San Jose Raiders. This “kid” was already a veteran among the rookies who showed up that night. It probably helped that Franqui’s big brother, 15-year-old Steve, was the youngest snare drummer with the corps and her mom Sue went on tour during the summer with the corps as well. After intense pre-season preparations, the corps began its tour, which consisted of eight California shows and seven competitions in the second half of the season that culminated at the DCI World Championships at the Cotton Bowl in Dallas. At those local competitions, scores juggled between the Mandarins and Vanguard Cadets, and even once with Blue Devils B. That was a quite an achievement for the Devils who were a Class A-60 corps at the time and fielded fewer members. In the first show in June, Mandarins won by more than a point. Vanguard came back to win the next one. Back and forth it went. Beginning in August, Vanguard Cadets expanded its tour into Illinois, Kentucky, and Ohio. Once in Texas, the corps shared accommodations with its fellow California competitor, the Mandarins, a Class A-60 corps that was already a two-time DCI World Champion. Monday, August 12 marked the World Championship Prelims competition in Dallas. The Finals competition was held the next day for advancing corps. For staff and marching members, that DCI experience pulled all emotions and left stirring memories. JW Koester: “At the Prelims it was a very intense time because while we thought we had performed quite well, there were several other corps who also felt the same way. (Of note, there were 19 competitors in Vanguard Cadets’ A-Class division in 1991 including early versions of Carolina Crown, Spartans and Southwind.). So, when our score was announced and we knew that we had advanced to the Finals competition, the corps broke into a huge cheer. Dave Leon: “I didn't have enough of an appreciation for what we did in 1991 until the 1992 season when we found out we wouldn't be going to the Championships. It was then that I realized what a big deal it was that we had not only gone and represented the Vanguard organization so well, but we had done something no other Vanguard cadet corps had ever done. Dylan Thompson: “Finals was the biggest thing that I had ever been a part of, in my life, ever. The scope and scale blew my mind. To see so many people that were interested in the same things as me. I think that is when I fell in love with DCI. In Dallas, Vanguard Cadets went from third place in the Prelims to fourth in the Finals, missing out on a bronze medal to the all-girl Canadian corps Ventures by only a point. Both Vanguard Cadets (Class A) and Blue Devils B (Class A-60) took fourth place in their respective divisions (classifications would change to Division II & III in 1992 and Open Class in 2008). But this was old hat for Blue Devils B having first made the trek to the DCI Championships in 1977 in Denver. In October, the 1991 Vanguard Cadets gathered to perform in the City of Santa Clara’s annual Parade of Champions. Perennials in the parade of distinguished Santa Clara groups and athletes, Vanguard had the honor of marching last. This always provided a humorous sight especially for audiences at the end of the procession: corps members, marching first with their high school band, would then sprint to join their Vanguard corps en route, still donning their band uniform. Once the parade was completed, each corps would gather up and perform its show one last time. While the Vanguard Cadets would not attend the World Championships the following year, the corps’ “Far and Away” production in 1993 earned a silver medal finish in Division II competition. In 2000, members of the Vanguard Cadets captured the corps’ first gold medal with additional titles to come in 2008, 2013 and most recently in 2015.